The graph below shows a wholesale price index from January 1918 to June 1922 for Germany (with data from Bresciani-Turroni 1937: 442, Table V). With regard to inflation before the catastrophic take-off of 1921, two points should be made. First, what is noticeable here is the serious inflationary spike of late 1919 to early 1920. Presumably the depreciation of the mark in 1919 and to some extent the large deficit of 1919 were linked to this inflationary spike. But the inflation was probably also linked to the worldwide boom that occurred in 1919 and early 1920, as prices rose all over the world (Holtfrerich 1986: 207–208). But, remarkably, as German investment was maintained in 1920 and a boom developed in Germany as many other Western economies like the US and the UK fell into recession (Holtfrerich 1986: 210), wholesale inflation stabilised and there was even some deflation. From early 1920 until June 1921 there was a stability in German wholesale prices as can be seen clearly in the graph. And this was at a time when the money supply was rising sharply too and the deficits (although falling) were still large. One has to ask why, if the budget deficits were the primary and major cause of the hyperinflation, the wholesale price index stabilised in 1920 and early 1921 and did not explode until after the London ultimatum of May 1921. Bresciani-Turroni, Costantino. 1937. The Economics of Inflation: A Study of Currency Depreciation in Post-War Germany (trans. Millicent E. Sayers), Allen & Unwin, London. Holtfrerich, Carl-Ludwig. 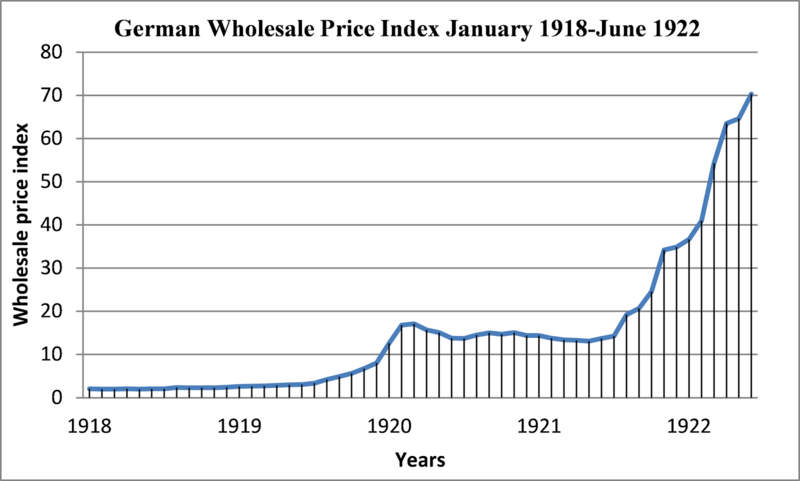 1986.The German Inflation 1914–1923: Causes and Effects in International Perspective (trans. Theo Balderston). De Gruyter, New York.